Railay Bay is a small peninsula located between the city of Krabi and Ao Nang. Railay Beach is accessible only by boat due to the high limestone cliffs cutting off mainland access. These cliffs attract rock climbers from all over the world, but the area is also popular due to its beautiful beaches and quiet relaxing atmosphere. Accommodation ranges from inexpensive bungalows popular with backpackers and climbers, to the renowned jet-set resort of Rayavadee. The four main areas of Railay consist of Pranang, West Railay, East Railay and Tonsai, with Tonsai catering more to climbers. Railay Beach was not severely affected by the tsunami of December 26, 2004. East Railay Bay is the docking point for boats arriving from Krabi. The East Beach is primarily covered in dense mangrove which is unsuitable for swimming. West Railay Bay connected to the East side by paths through the large resorts or by trails through thin jungle cover -- is the primary destination for beach-goers in Railay. The beach, as pictured in the panorama below, is flanked by high limestone cliffs on either side. Long-tail boats are available to hire for transport to Ao Nang, 10 minutes north of Railay. 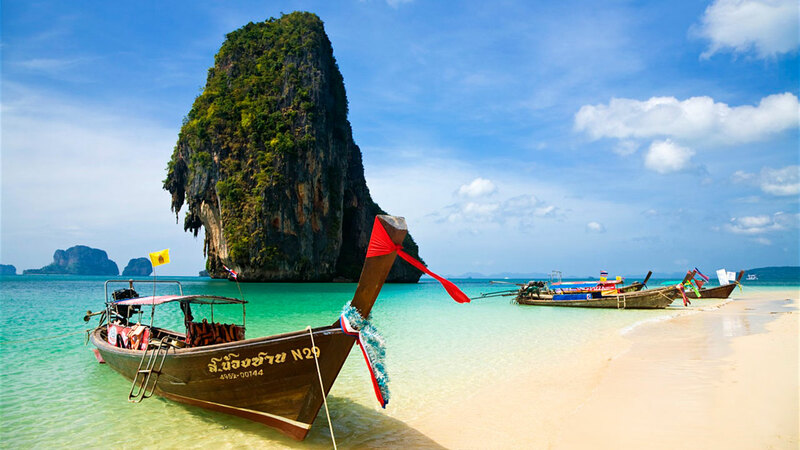 In addition, ferries departing Railay for Koh Phi Phi and points west including Phuket depart from the West beach. The focal point of West Railay Beach is centered on a short promenade (walking street) lined with restaurants and shops. The perfect setting to realize the dream of your own Beach, Garden, Dream Island, Waterfall, Buddhist Temple, Private Villa, Sunset Wedding, Sunrise Beach, on Yacht or any place on your request and tropical honeymoon with Thailand’s leading specialists in romantic beach weddings. Thai Wedding Packages : Thai Wedding Ceremony is the beautiful and meaningful ceremony according to Thai people culture open all religious all visitor from world wide to touch the good feeling and impressing with our Thai culture. Western Non Religious Style : Not only your mother home town can possible doing Western Wedding Ceremony but Thailand can also make your dream wedding come true by the beautiful venue set up with lots of flower on it as well. Pre Wedding Packages : Many places provided such an amazing view and location. Stunning service with the professional photographer to make you Pre Wedding Photo Shoot day come really impressive in overall photos. Buddhist Blessing Ceremony : Secluded beach will be your Blessing Ceremony located for your blessing day to touch the target of good luck good love and good life after participate in this Blessing Ceremony by Monk. Protestant Marriage Package : A Protestant Wedding differs from other religions in that it is a worship service in which, the will of God is served and Lordship of Jesus is proclaimed. The wedding guests take part in the wedding, by sharing in songs, Christian readings in responses to the bride and grooms exchanging of vows, the couple may share in communion during the wedding. Thai Wedding Group like to present all those mention by our professional create and make your dream come true in the kingdom of Thailand or Siam. The land of smile come and find us for more in detail contact our wedding services. Browse our Railay Beach Wedding Packages Showcase - Married Couple at Railay Bay : Krabi, Thailand.